Mother's Day is just around the corner and I have another giveaway opportunity for you! This could be for you, as the mom or for you to give to your mom or a special lady in your life. As a mom, I know it isn't about the gifts but we want you to enter to win this fab giveaway! Happy Mother's Day. 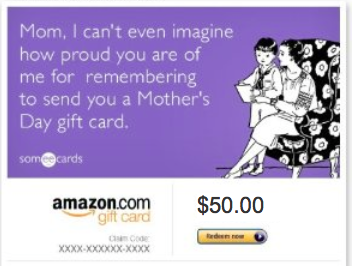 After you enter my $50 Amazon giveaway head over to Makobi Scribe to see her Mothers day gift ideas worth over $2000. Then enter the grand prize drawing of a $1000 worth of Karina Dresses. April is National Financial Literacy Month. How fit financially are you for the future? We are a family of 5 with 3 in college starting in the fall so finances are always on our mind. How about your family? What financial concerns are on your mind? I participated in an Influencer Program on behalf of Mom Central for TCF Bank. I received a promotional item to thank me for participating. As I mentioned, finances are on our mind with the teens all in college. We are at that age where we are thinking past college and into retirement. We do what we can to save money by not overspending. We can always use extra help in planning out our distant future. Besides my husband and I we do think about our 3 daughters and their futures. Our financial goal for them is to not have them saddled with huge college loans and debit. How about your family? 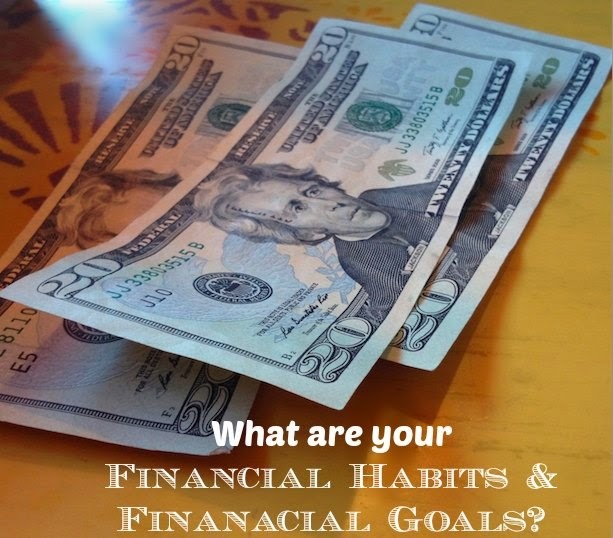 What financial issues are you dealing with and planning? This month, TCF Bank wants you to consider your financial habits by taking their fun quiz to find out your inner "financial animal." 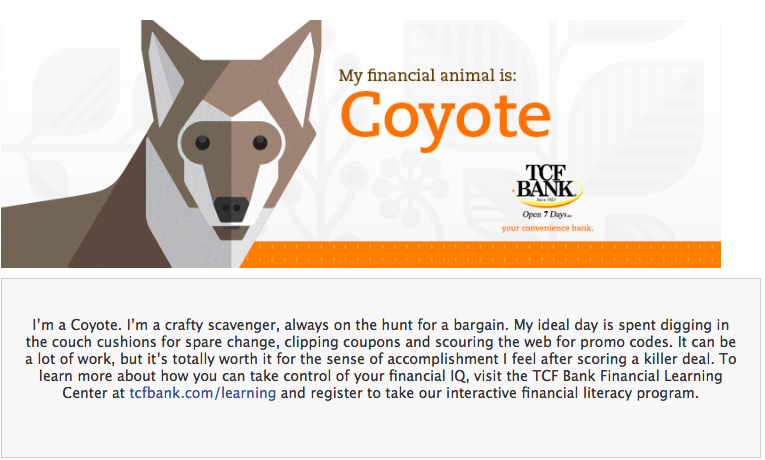 I took the TCF Bank Financial Animal Quiz to find out my "financial animal." This was a very helpful quiz. Each question gave you several choices. After reading the choices I knew right away what my answer choice would be. According to the quiz my financial animal is a Coyote. The Coyote is a crafty scavenger who hunts for a bargain. This is me 100%. Although I don't dig through the couch cushions for spare change, I'll gladly collect any I find in our laundry room which the teens leave behind. I do believe in clipping coupons, printing them off online and using promo codes for online deals, free shipping,etc. I have been doing this our entire marriage and do not find that it is a burden to do. I'd rather save where I can, especially on the day to day expenses. My kids know that they can try a new product at the store if I have a coupon for it! ha ha I was not surprised at all of what "financial animal" I am. I do enjoy being a crafty scavenger and love looking at my receipt to see how much I have saved at the store for the sake of my family and for our financial future. How about you? Want to find out your "financial animal"? Click on the link above to take the quiz. It is really quick and only took 1 minute, if that. After you take the quiz, they will share the results right away. I did click over to the TCF Bank site to learn more about their financial literacy programs. I was most interested in their TCF Financial Scholars Program geared toward high school students. Even though our youngest is starting college classes in the fall she is just 16. We will homeschool her with dual credit classes at our local college. I would love to include this financial curriculum into her studies next year. I hope that you take time to check out the financial quiz as well as their website. Understanding your finances will allow you to best plan and prepare for your future and the future of your family. The TCF Bank's Financial Literacy Resource Center is full of information to give you practical and impartial information about money management for everyone. What are some of your financial goals? I shared mine and would love to hear yours, too! 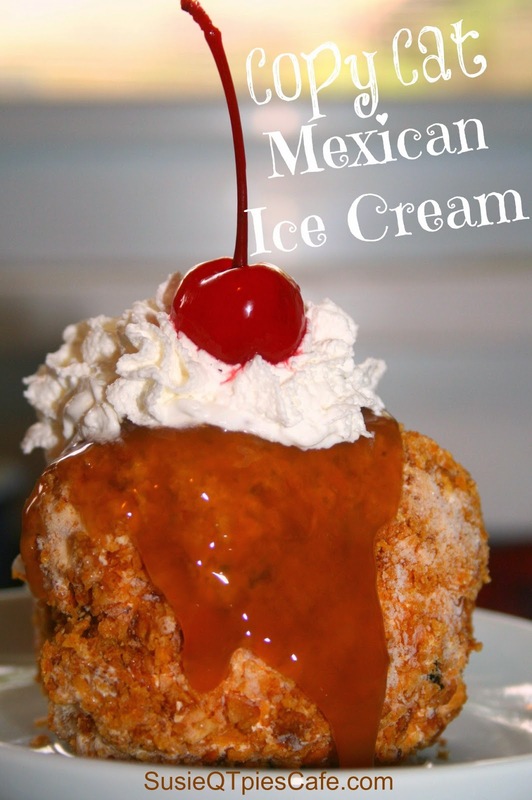 We all love that crunchy, sweet ice cream dessert found at Mexican restaurants. It is one of those treats you order to share with others at your table! My daughter and I made this dessert at home a few years back. 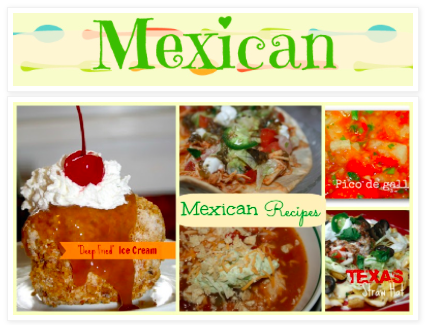 This is the perfect dessert to get the kids to help make and serve at your Cinco de Mayo party or with any fun family night meal. Mother's Day is just around the corner and I have a great giveaway for you to enter and win for that special woman in your life. This tasty giveaway could be for your mom, mother in law, aunt, friend, sister, etc. What a fun way to say thanks for all that you have done! I'm join in this giveaway with other blogs. I do not pick the winner so if you do win, let me know and good luck to you! 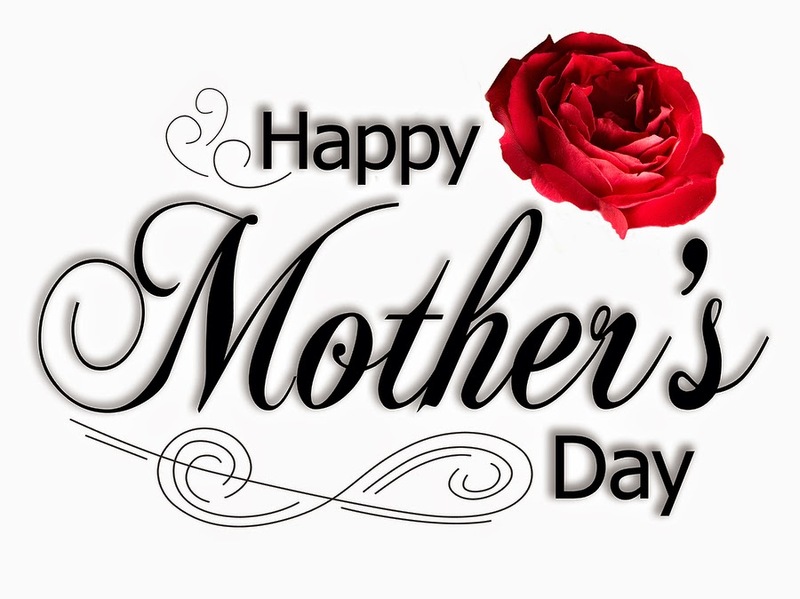 Happy Mother's Day to all of you who have actually fulfilled your job as a mother or a mother figure. a basket full of delicious snacks. 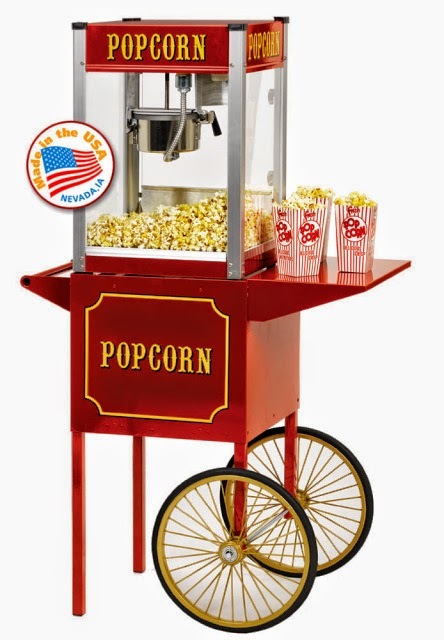 For more than 30 years, The Popcorn Factory has been the "popcorn authority" with their impressive collection of crowd-pleasing gifts and great-tasting snacks. 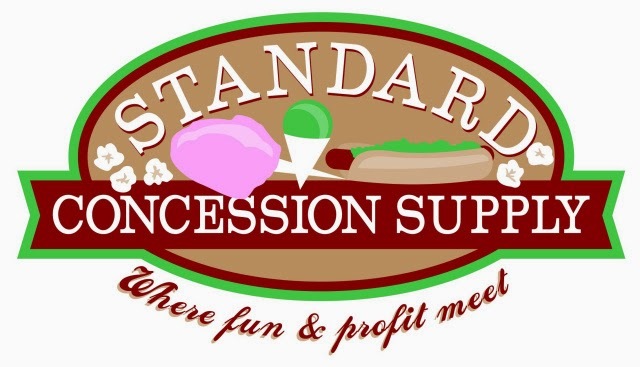 They start with the finest corn grown right here in the USA and transform each kernel into premium popcorn using 100% corn oil and infusions of the very tastiest flavors. The Popcorn Factory pops over 1 million pounds of popcorn per year, and all of their popcorn is Kosher OU-D. Since 1979, they have been delighting customers with delicious, premium popcorn and impressive, all-occasion gift tins, baskets and towers. In all that time, they remained committed to bringing you fresh product, unique ideas and above all, complete satisfaction. And we back this guarantee with our Popcorn Promise: You and your recipients must be absolutely delighted! 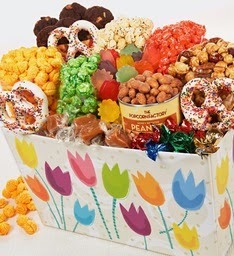 Their sturdy basket covered in brightly colored tulips is generously sized to hold a whole lot of deliciousness. Carefully tucked inside are five flavors of our freshly popped Gourmet Popcorn (Cheese, Cracked Pepper & Sea Salt, Cinnamon, Almond Pecan, and Sour Green Apple Kettle Corn), Triple-chocolate Cookies, Honey Roast Peanuts, Double-twist Caramels, Gummi Tulips, White Candy-coated Gourmet Rainbow Pretzels, and Foil-wrapped Sour Hard Candies. Giveaway will ends at 12:00 AM (EST) 5/11/2014. will result in another winner to be drawn. 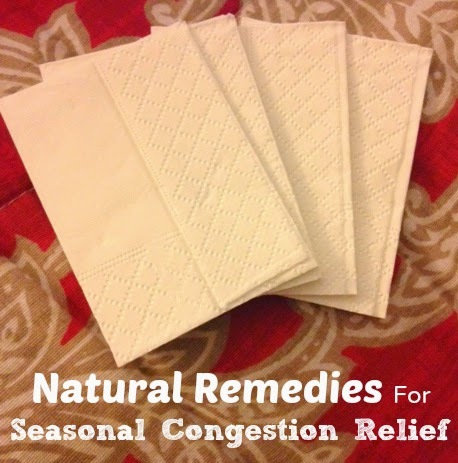 Do you or someone in your family suffer from seasonal congestion? Does it keep you indoors? Everyone in my family suffers seasonal congestion on various levels in the spring and in the fall which does interfere with daily activities. We've tried various treatments and always looking for something new. How about your family? What do you use to combat this type of congestions? I participated in a campaign on behalf of Mom Central Consulting for Zarbee’s Naturals. I received a promotional item and a product sample as a thank you for participating. 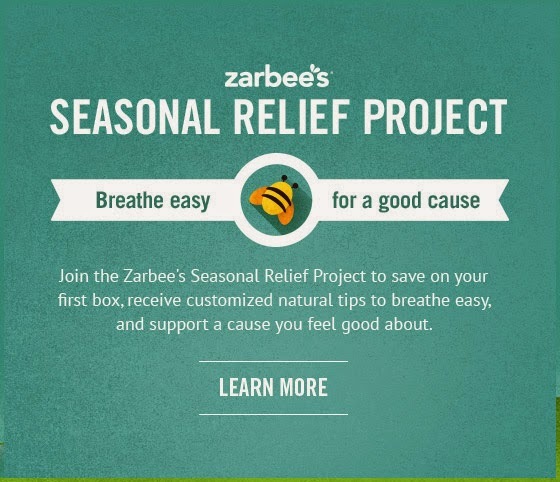 Just recently I have learned about Zarbee's Naturals' Seasonal Relief to help seasonal congestion and excited to try it this spring. As soon as spring hits we know that the following few weeks will be miserable. This can keep us indoors with seasonal suffering. 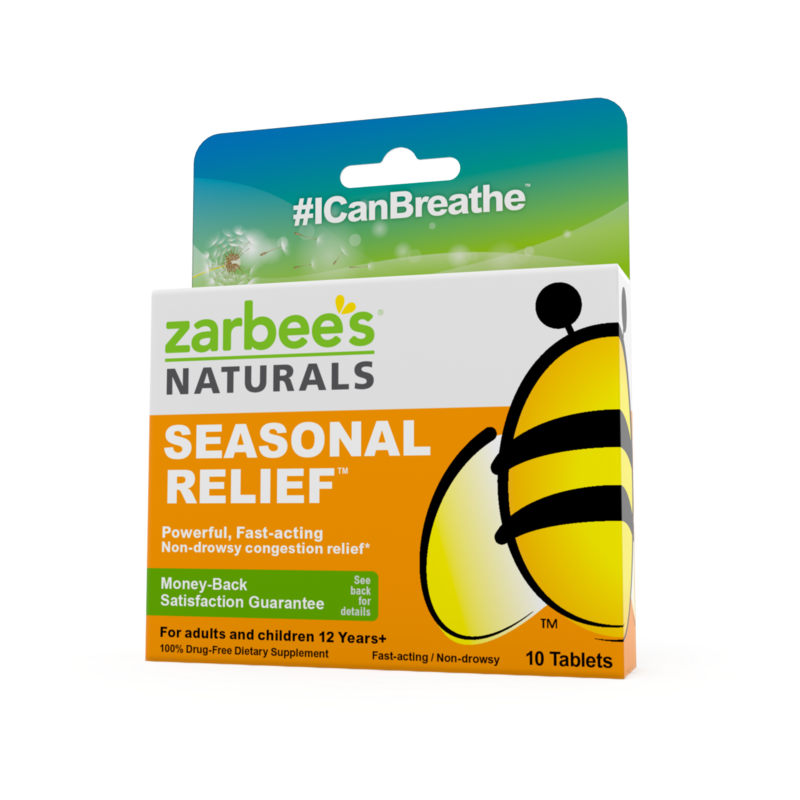 Zarbee's Naturals use all natural ingredients and is made with Butterbur to help combat congestion. This Dietary Supplement is all natural and goes along with our other natural remedies. These statements have not been evaluated by the Food and Drug Administration. This product is not intended to diagnose, treat, cure, or prevent any disease. Would you like more information on Zarbee's Naturals? Good news is that it is available over the counter at CVS and Target. This supplement is intended for children 12 years of age and over. 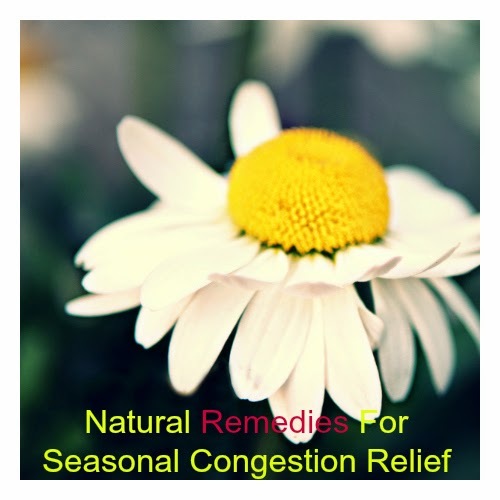 You can also stop over at the Seasonal Relief Project Website to receive your own customized seasonal congestion tips and sign up for a product sample. Stop over and check out their website to get more information if anyone in your family suffers from seasonal congestion. Do you have any natural remedies? I'd love for you to share yours in the comments below. I'm always looking for natural remedies. I'm loving all of the natural and healthy hacks that are popping up all over the internet. It seems as though we buy every new product on the market these days because we think it is quicker and cheaper to use. Most of the time that isn't the case. If you are trying to save some money, try adding in natural cleaning ideas for the sake of your budget and the environment. In honor of Earth Day I wanted to share this post with you. 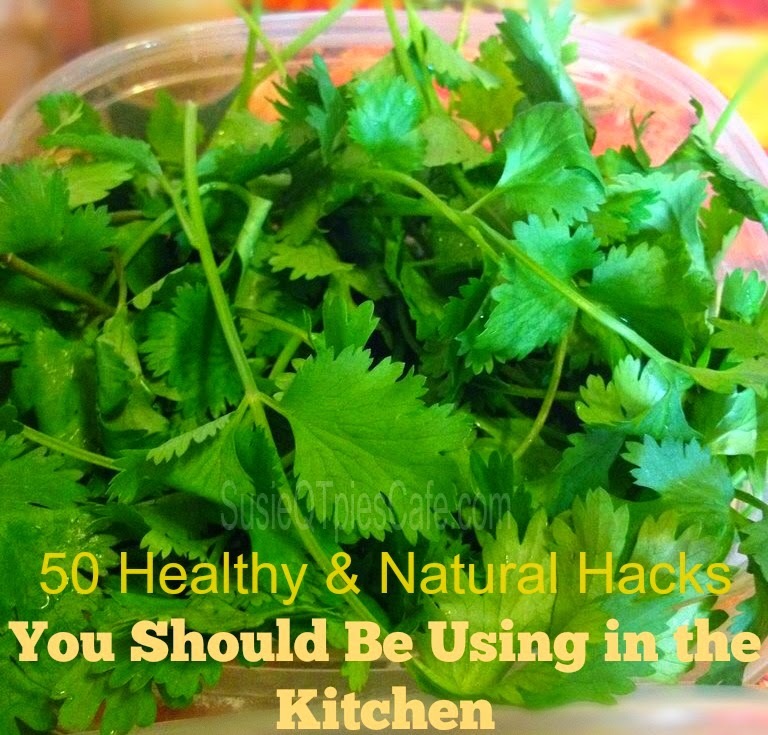 If you have some natural hacks to share, leave them in the comments! Most people spend a great deal of their time at home in the kitchen. This important room is used to prepare meals, for informal eating, and as a casual gathering place for family and friends. So why not start here when it comes to some helpful tips for a healthy kitchen that can stretch your dollar and are also safe for the environment. These little tips and tricks are known as kitchen hacks now a day’s but some of them have been passed down by grandma’s from every nationality for years and years. The below list of healthy kitchen hacks we’ve created only use natural ingredients and will help you with anything from cleaning and sanitation to reducing your tears when cutting an onion. Some common household cleaning products may contain hazardous ingredients. Many Americans have turned back to natural household cleaning solutions for safety and more eco-friendly reasons. Rather than taking harsh detergents to your cast iron pots and pans, scrub them clean with a dry paper towel and coarse salt. A pinch of salt and a paper towel will create a salty solution that can works wonders. 1. To clean an electric kettle with calcium buildup on the heating element, boil a mixture of half white vinegar and half water – Empty it out and your kettle should be sparkling clean. 2. Cut one lemon into two halves, sprinkling baking soda on the first half. – Use the lemon alone to scrub dishes, sinks, and countertops. 3. Baking soda and is a great all purpose cleaner. – Use it to deodorize drains, clean stovetops and stainless steel sinks. 4. If aluminum pans look dull and cloudy, just boil some apple peels in them. – This will shine up the aluminum and make your house smell good at the same time. 5. To clean your coffee pot, fill it up with a cup of vinegar added to the pot of hot water then run it through the normal cycle. -Run a few cycles after of plain water to have your coffee pot look brand new. 6. Loosen up the caked up food on your pots and pans. – Soak your pots and pans with some tea bags overnight. This will make it much easier to clean in the morning. 7. To unclog drains, pour some baking soda down the drain and then add ½ cup of vinegar. – Then rinse with very hot water. This should get rid of any blockage. 8. Add a tablespoon of vinegar to hot soapy dish water. – This will cut down on grease and any odor left from food on the dishes. 9. Olive oil is great for stainless-steel surfaces. – For extra sparkle, pour olive oil onto a dry cloth and buff the surface. 10. Remove tarnish from copper and brass cookware. – Squeeze ketchup onto a cloth and rub it on pots and pans. Within just a minute or two, they should be back to the coppery color. Rinse with warm water of course. Here are some great ways to get rid of those pesky stains and odors in the kitchen. 11. Sprinkle a dash of salt in an empty airtight Rubbermaid container before you store it, you’ll keep the odors away. – It will definitely make a difference with your containers that have had one too many pieces of lasagna in them. 12. For cleaning smelly hands after chopping garlic or onions, rub them on a stainless steel spoon. – The steel is somehow supposed to absorb the odor. 13. Remove tea or coffee stains from your fine china by mixing up a paste consisting lemon juice, cream of tartar, and baking soda,. – Rub it over the stains and they’ll come off with ease. 14. After using a lemon, drop both lemon halves down the garbage disposal . -This is a clean scent that will freshen the smelliest of kitchens. 15. Run an empty dishwasher load with vinegar. – Toss a cup of white vinegar into the bottom of an empty dishwasher and run the normal cycle. It cleans out old food particles to keep your dishwasher smelling great. 16. When you are preparing raw fish, that smell on your fingers can hang around for days. Rub your hands with lemon juice which will neutralize the odor. 17. Lemon can deodorize cutting boards. – Yucky smelling cutting boards can be scrubbed down with a lemon . Don’t rinse the board for about an hour. Then wash with soapy hot water. 18. To clean fruit stains off of your fingers, rub them with a fresh, peeled potato. – White vinegar will also have the same affect. 19. Vanilla can get rid of nasty odors in your freezer. – Wipe down your freezer with a cotton pad that is lightly soaked with pure vanilla extract. Use these hacks to keep your produce fresh, clean it well, and even make spices. 20. Separating bananas from the bunch will keep them fresh for a longer time. – Bananas release gases which cause fruits to ripen rapidly. Keep your bananas in separate areas away from each other. 21. Keep tomatoes and citrus fruits like lemons away from the refrigerator. – This will keep them juicy and they will even have a better fragrance. 22. To keep potatoes from budding in the bag, put an apple in with them. – This enhances the taste and will make them last and extend their shelf life. 23. Keep iceberg lettuce fresh in the fridge by wrapping it in a clean, dry paper towel. – Store the lettuce and paper towel in a sealed baggie and put in the fridge. 25. Instead of cutting off the leafy tops of celery and tossing away, make your own celery flakes. – Wash and dry the leaves and bake them in the oven at 180° F until they get crispy. Store the flakes in an airtight container and use for soups or whatever else you’d like. 26. Freshen vegetables with vinegar. – If your vegetables are wilted and seem like they might be on the way out, soak them in 2 cups of water and one tablespoon of vinegar. 27. Use this concoction to keep the fruit flies away from the arrangement on your table. – A small dish of wine, a splash of water, and a drop of dish soap will do the trick. 28. Use a drinking straw to core a strawberry while still leaving most of the fruit. – Push the straw through the bottom of the berry and out through the top. 29. Put a lemon in the microwave for about 20 seconds to get the most juice. – Let the lemon sit for a minute and then roll it around back and forth on the counter a couple times. 30. Cauliflower will remain white and give off no odor if you cook it in an equal parts milk and water mixture – You can even use the left over liquid for a soup or cream sauce. We’ve all goofed up when it comes to cooking. Here are some simple tips that will help you in a pinch. 31. If you’ve burned your gravy, pour it into a new pan and sprinkle a dash of sugar in it. – The sugar will counteract the bitterness from the burned gravy, but won’t leave it with a sweet taste. 32. Did you add too much salt? Throw in a peeled potato. – Throw in a peeled potato while your dish is still cooking. 33. When boiling eggs, add a pinch of salt to keep the shells from cracking. – This is great right around Easter time. No one wants cracked Easter eggs. 34. Is your rice a bit brown on the bottom of the pot? – Place a piece of white bread on top of the rice for approximately 5-10 minutes. This will take away that burnt flavor. Remember to take off the burnt part when you serve it! 35. When your casseroles or other dishes end up to greasy, add a piece of ice. – The ice cube will attract the fat, which you can then spoon out. 36. No need to buy expensive mixing bowls with rubber bottoms. – Set you’re bowl on top of a damp cloth. You’ll never have to worry about it sliding around while you’re mixing something. 37. Burnt food smells can removed from the air by placing a shallow bowl about ¾ of the way full with white or apple cider vinegar . – The odor should disappear in less than a day or if it’s a really strong odor it might take 1 to 2 days. 38. Soak stove burner grates in 1 gallon warm water and 1/2 cup baking soda. – them Leave them in there for 30 minutes. Rinse and dry them and they will be looking shiny and new. 39. To get rid of those stuck on food splatters in the microwave, place a water-soaked sponge inside and cook in on high for two minutes. – Leave the microwave door closed for another five minutes to let the sponge cool off. The steam will loosen up the food and you can easily wipe it all off without the use of chemical cleaners. 40. Spills in the oven – If that dish your cooking starts to cook over, take it out of the oven and pour salt on the spill. This will soak it right up. When the oven is cool, wipe with down with a damp sponge. 41. If you’ve nicked yourself in the kitchen, clean and disinfect the cut, let dry, and coat the wound with clear nail polish. – This is an easy and quick waterproof bandage that stays on for days and is much more sanitary than a wet band aid. 42. Soak an onion in water before cutting it. – The water will dilute the sulphuric compounds . 43. Or else you can freeze the onion before cutting it for about 10 minutes. – The sulphuric compound that leads to tears will not react as quickly when it’s cold. However, don’t freeze it for too long because it can affect taste. 44. Did you burn your finger taking that pain out of the oven? – Immediately rub the area with spicy mustard to draw out the pain. 45. Did you catch one of those invisible hair-like splinters that that you can’t see but hurts really bad? -Simply press a strip of tape gently to your skin. This works far better than scraping away at your skin with fingernails or tweezers. 46. Just in case you don’t have spice mustard. – Vinegar, honey and even whole milk can be used to soothe any kitchen burn . This is a list of some other tips we found that could not be put in the categories above but are just as valuable. 47. When it’s time to thaw out that frozen roast, be sure to pour some vinegar over it. – Not only does it make the meat defrost faster, it also works as an awesome tenderizer. 48. After boiling pasta or potatoes, cool the water and use it to water your plants. – The water is filled with nutrients that your plants adore. 49. If your loaf of bread is starting to go stale, just put a piece of fresh celery in the bag and close it back up. – For some reason, this restores a fresh taste and texture to the bread. 50. To reuse cooking oil without tasting whatever was cooked in it, just add a 1/4″ piece of ginger to it. – It will remove any reminisce of any flavors and odors. 51. Water that has been boiled and allowed to cool will freeze faster than water from the tap. – This is a savior when you’re having a party and need ice in a hurry. 52. If glasses become stuck together after stacking them in your cabinets, it is possible to get them unstuck. – Just put ice in the inner glass and dunk the outer glass in some lukewarm water. The warm glass will expand and the cold glass will contract, making the glasses separate easily. 53. Pulling your refrigerator 1 inch from the wall can reduce the enter used by almost 40%. – You’ll barely notice the difference in your floor usage. Extra inches help, but the one is actually quite suitable. 54. Grab a bowl filled with cold water and let a few eggs soak in the bowl for two minutes. – The freshest eggs will stay at the bottom, and any expired eggs will rise to the surface. Eggs should stay fresh for up to three weeks when properly stored. much as you want to use. 56. 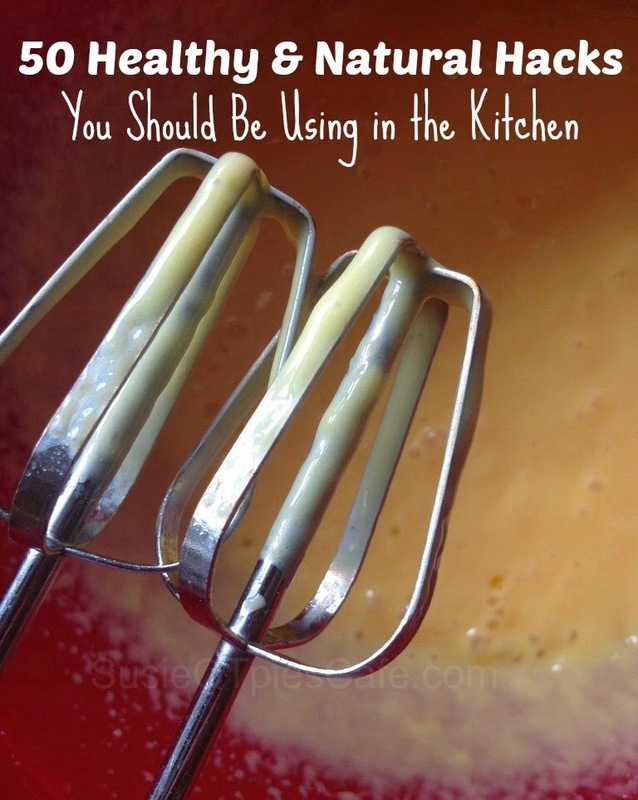 To double the amount of your butter used for spreading, simply whip it with a small amount of warm water. – it’s great for spreading on your bread or corn-on-the-cob. Just keep it in the refrigerator to keep it fluffy. It’s surprising just how much we can do with ingredients from our own homes. We hope that you found these hacks to be useful for you and your family in the kitchen. Hope you enjoyed this guest article. 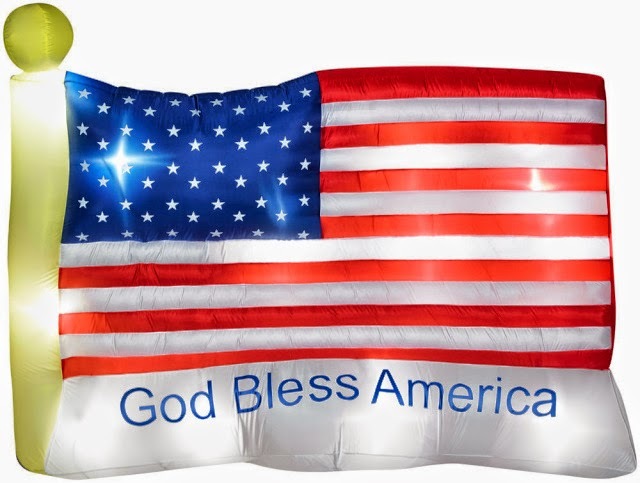 Do you like to decorate your home for Memorial Day and the Fourth of July? Today we have a giveaway perfect for all patriotic fans. 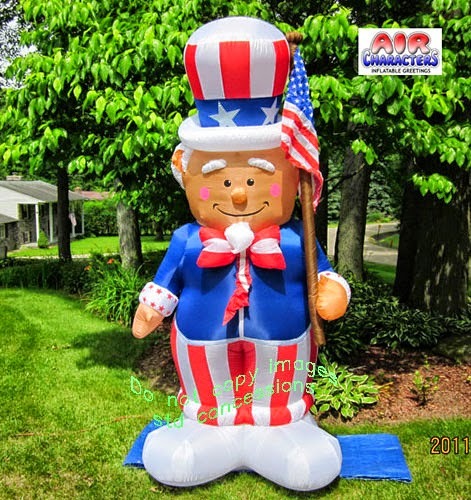 Enter below for your chance to win this inflatable Uncle Sam which would be perfect for ANY American celebration! with it's internal lighting that will create a glowing nighttime effect. to hold it down. 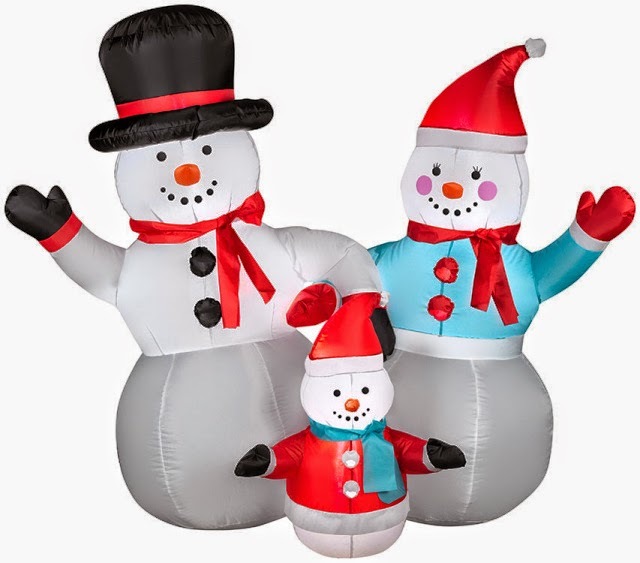 It is easily assembled for indoor or outdoor use. Visit their website today and checkout all the amazing deals and prices at the link below. the awarding and shipping of the rain gauge directly to the winner.